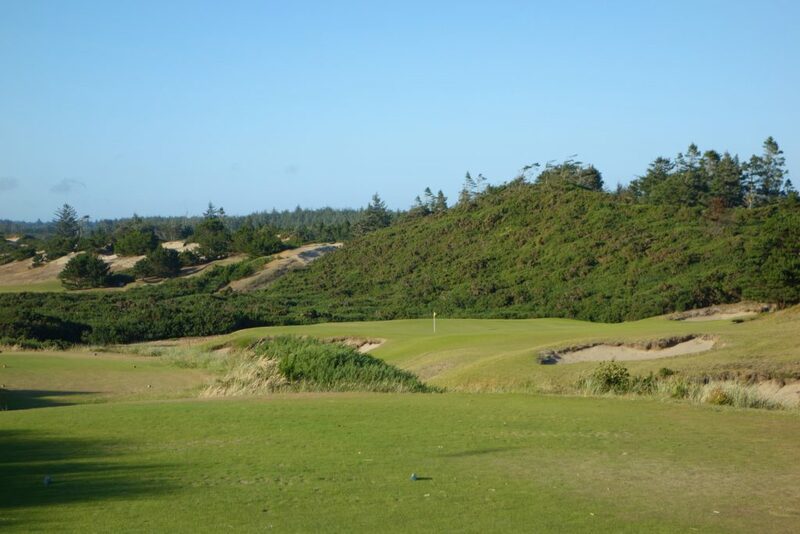 My flight into North Bend, Oregon swung low and made a sweeping pass right over the courses at Bandon Dunes. 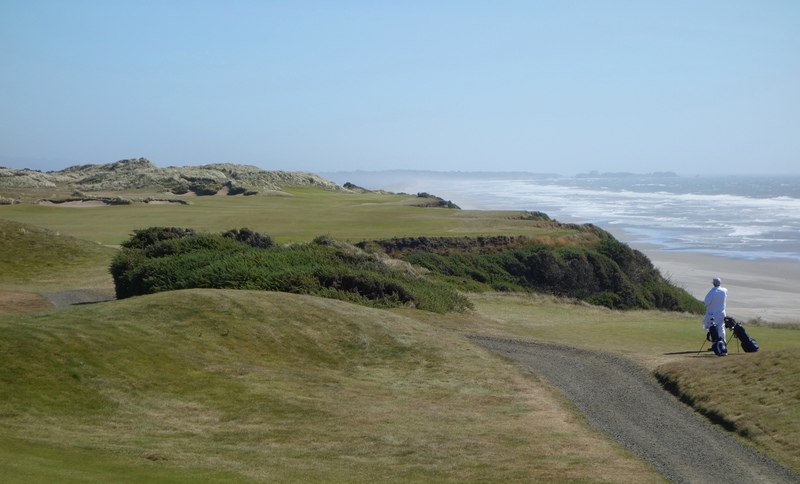 Despite having never visited the resort before, I quickly picked the clifftop holes at Pacific Dunes out of the crowd… Others golfers on the flight did the same, and the excitement was palpable as everyone de-boarded. 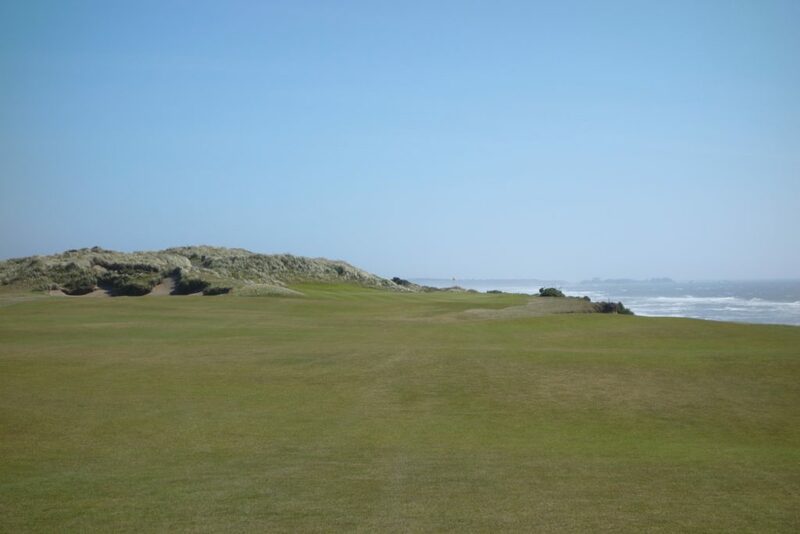 Thankfully, only 35 minutes after leaving the airport, I was standing on the first tee at Pacific Dunes ready to tee off. 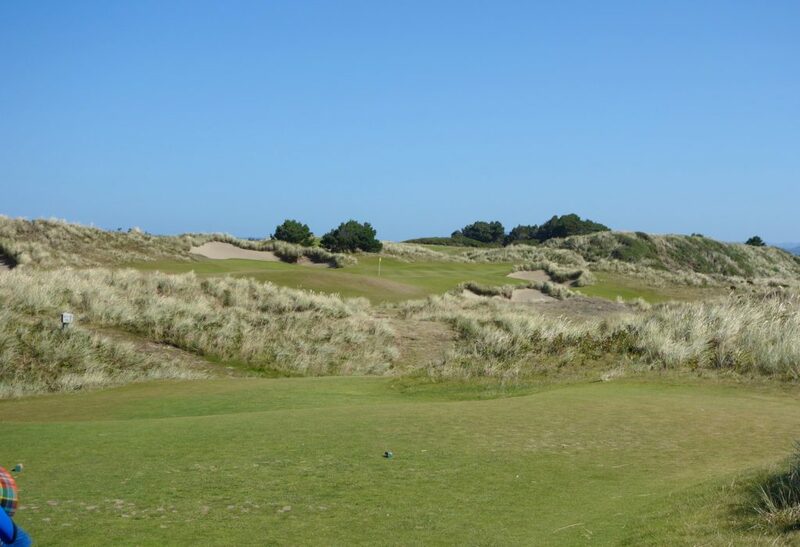 I made the journey to Bandon for work with a colleague from LINKS Magazine, and we had a whirlwind two-day tour of the resort before heading inland for more golf. 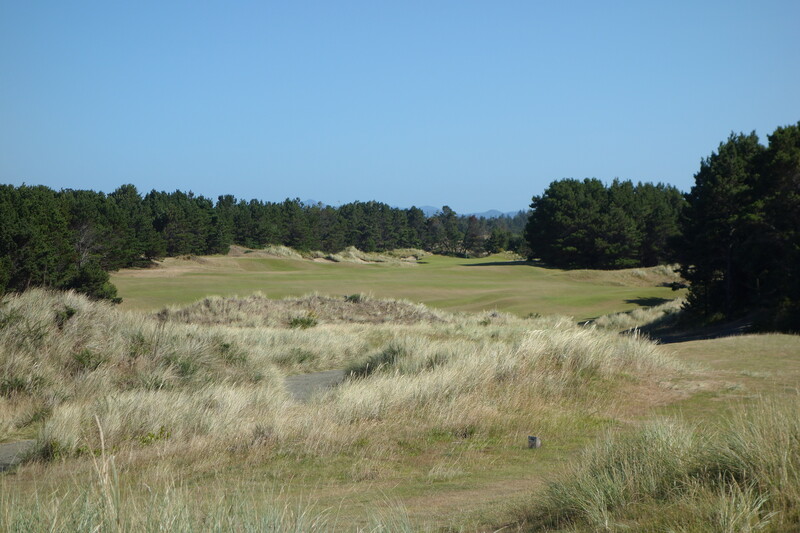 Pacific Dunes was our first round of the trip, and we teed off around 3:30PM with sustained winds of 35MPH. 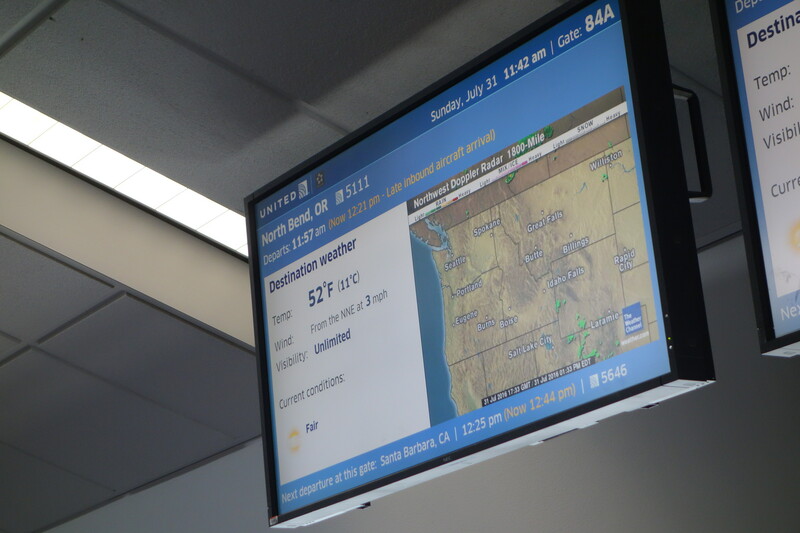 It was like being right back in Scotland! It took a few holes to find the groove, but I quickly found the old knockdown shot. 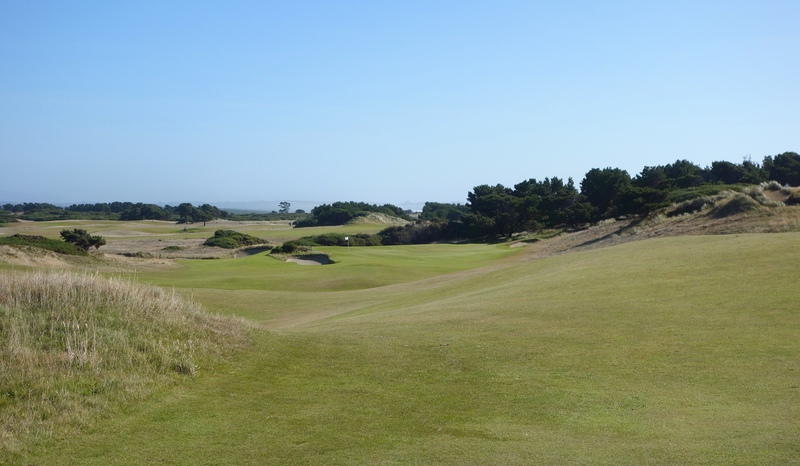 I was surprised at just how similar the turf and playing conditions were to Scotland, and I wrote a separate post on Bandon Dunes vs. Scotland that goes into more details along those lines. 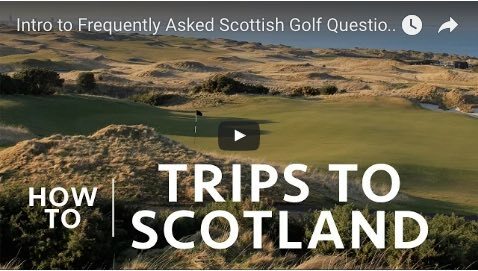 Tom Doak designed the course, and it rightfully gets compared to some of the best in the world. 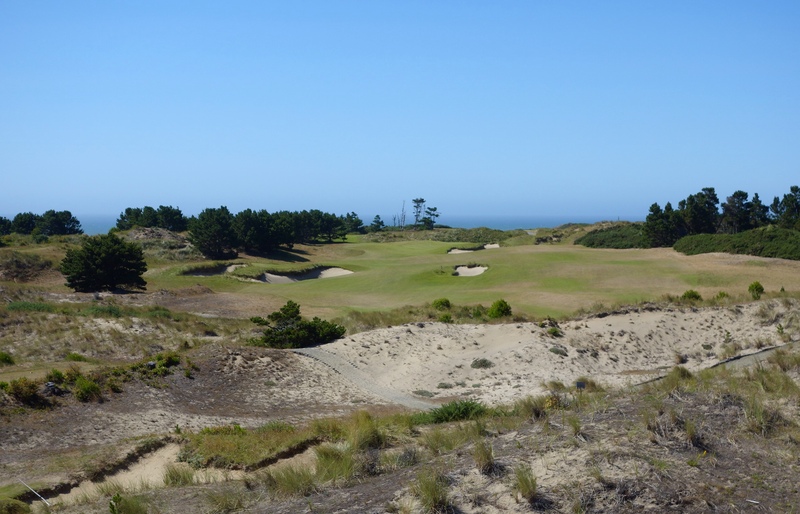 Places like Kingsbarns, Cypress Point, and Turnberry are stunning, but the impact of looking hundreds of feet down onto an expansive Oregon beach makes Pacific Dunes the most dramatic place I’ve played. I also love courses that show little teasers of what is to come. 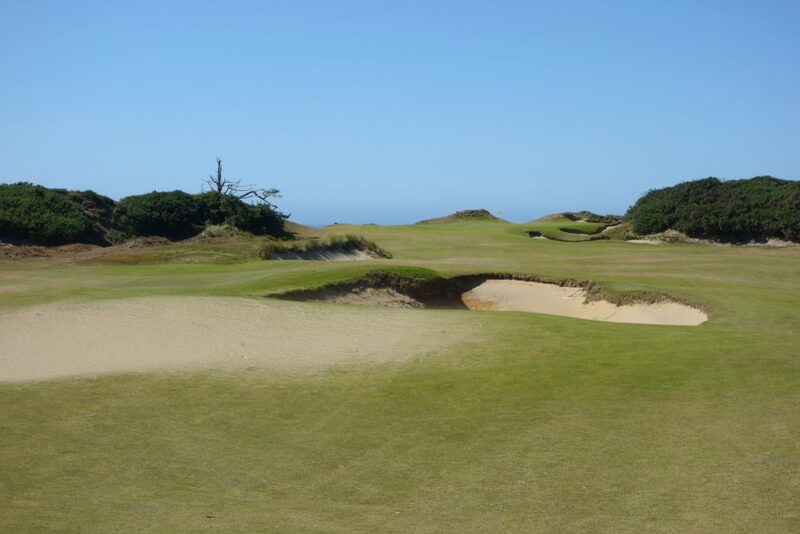 Pacific Dunes’ first three holes do that perfectly. 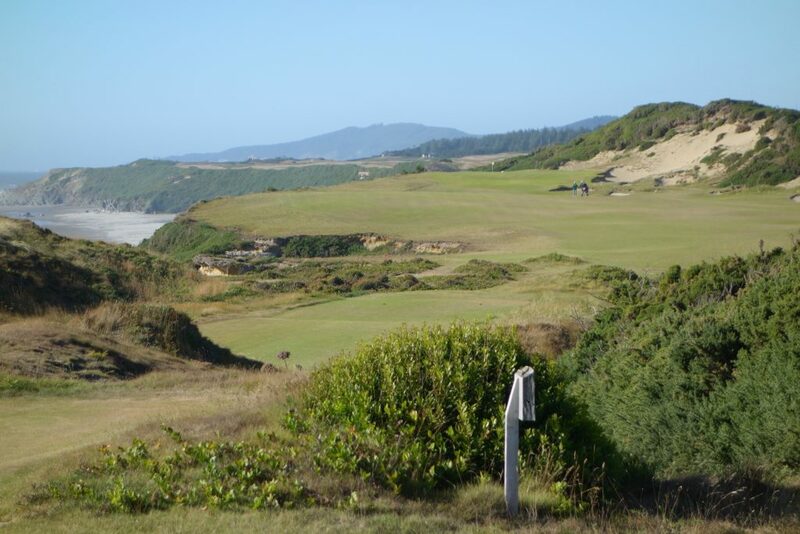 From the second tee you can see the ocean a few holes ahead. 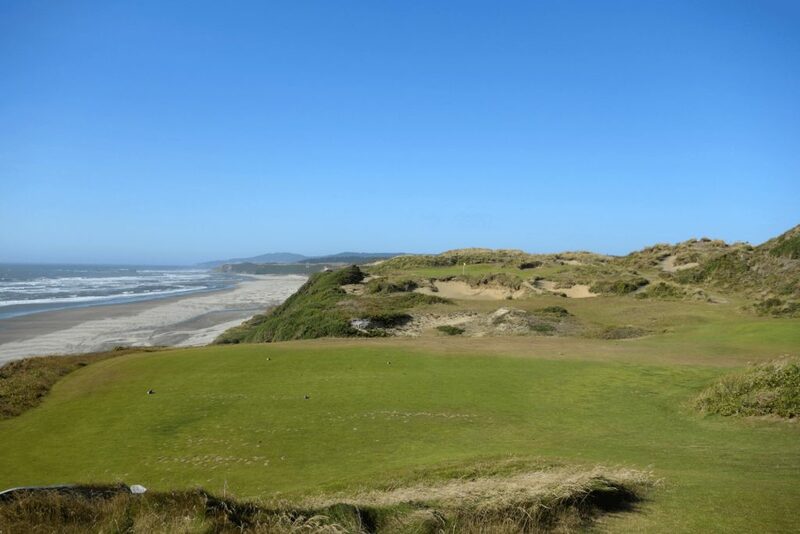 After the third green you look to your right at the Pacific Ocean and stunning 13th green. Everywhere you turn there is that, “I can’t wait until we get to that hole! !” feeling. Anticipation and excitement remain the entire round. 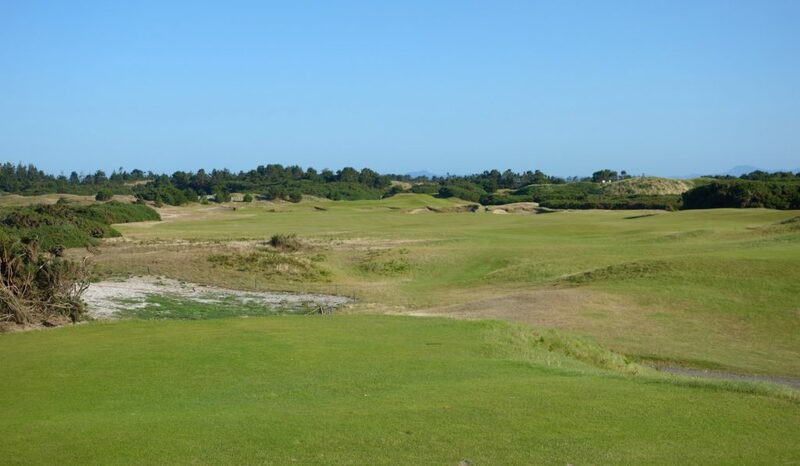 Hole #1 – 304 yards – The sloping green here provides a nice taste of the links-style golf that lies ahead. 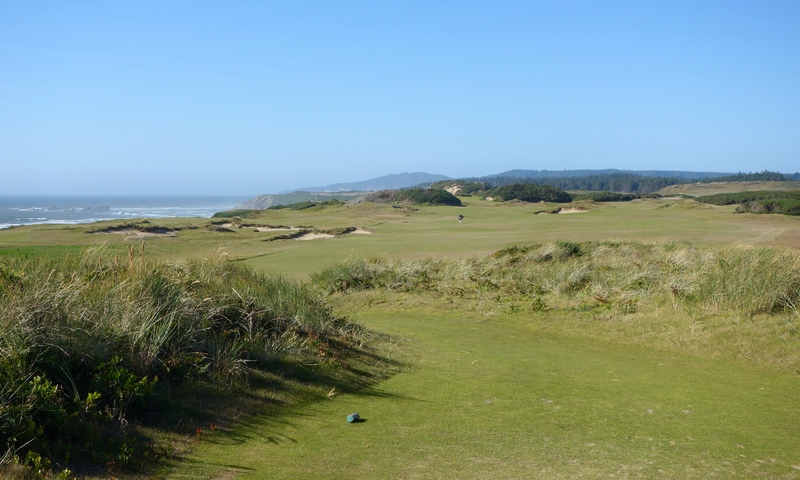 Hole #2 – 335 yards – The anticipation really starts to build here as this tee provides the first peek at the ocean. 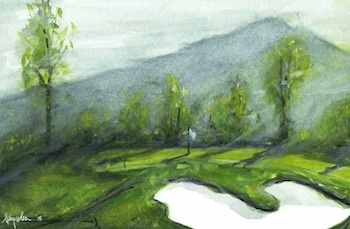 Avoid that middle bunker and aim center green on the approach. 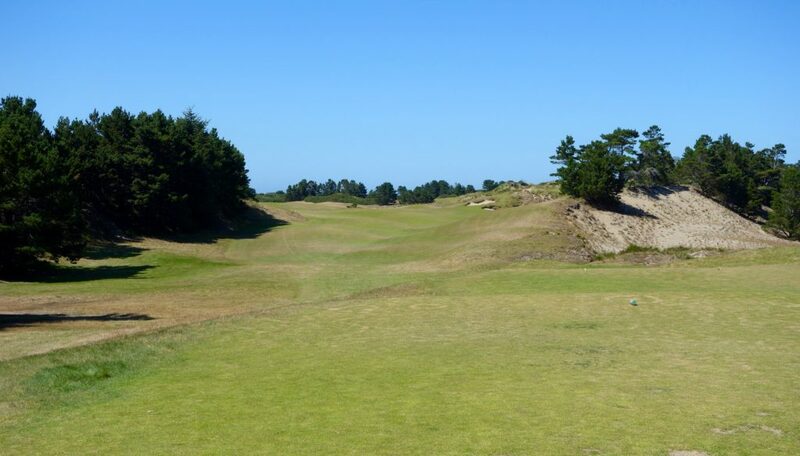 Hole #3 – 476 yards – If this hole doesn’t get you excited, I don’t know what will. The wind was whipping into our faces on this hole, and as you’ll see in the second photo, wind blows the sand out of the bunkers. 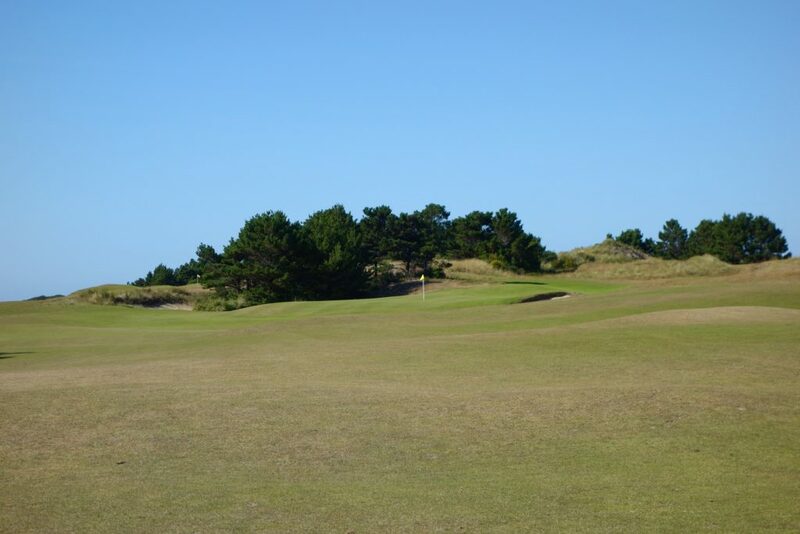 The green is slightly raised and tucked behind a corner in the dunes. 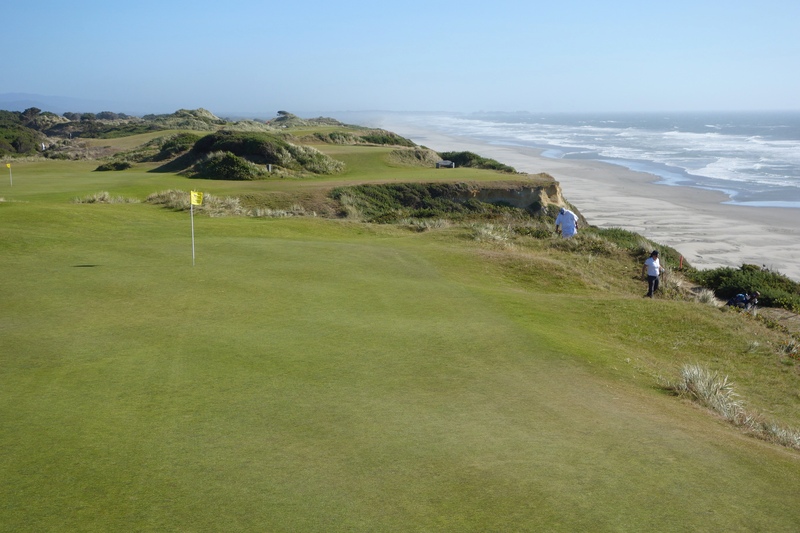 Hole #4 – 449 yards – This hole is truly cliffside. The right border of the hole is a 150+ foot drop to the beach below. There’s more room out there then you’d think off the tee! 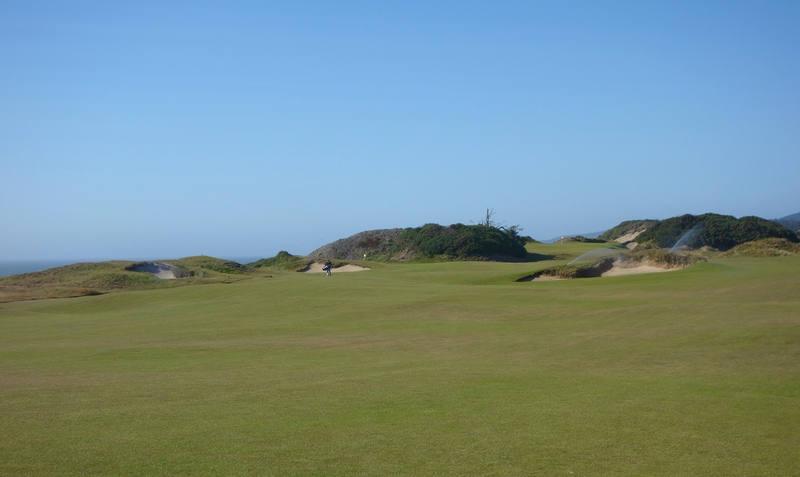 Hole #5 – 181 yards – That bump front left of the green has to be carried in order to get on in regulation. 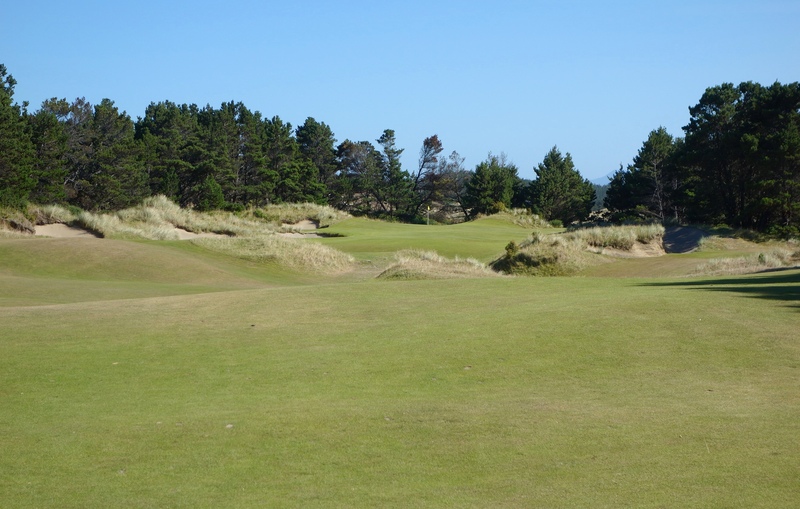 Hole #6 – 288 yards – I hit driver and a full 8-iron into this green playing dead into a gale. Fortunately, you can’t really tell in the photo below! The raised green adds to the challenge and requires good distance control. 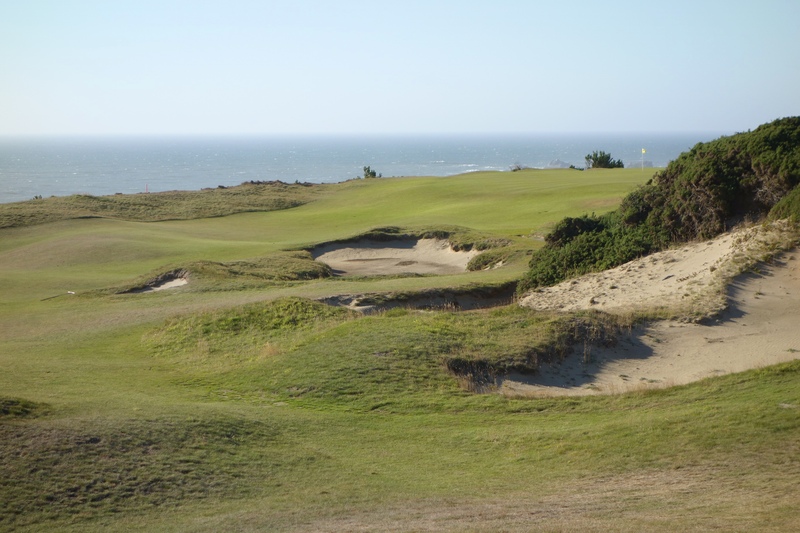 Hole #7 – 436 yards – At this point you’ve temporarily moved away from the coastline, but the holes don’t dip in quality. 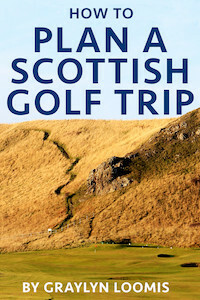 The deep green narrows towards the back, where you see the pin in the photo below. 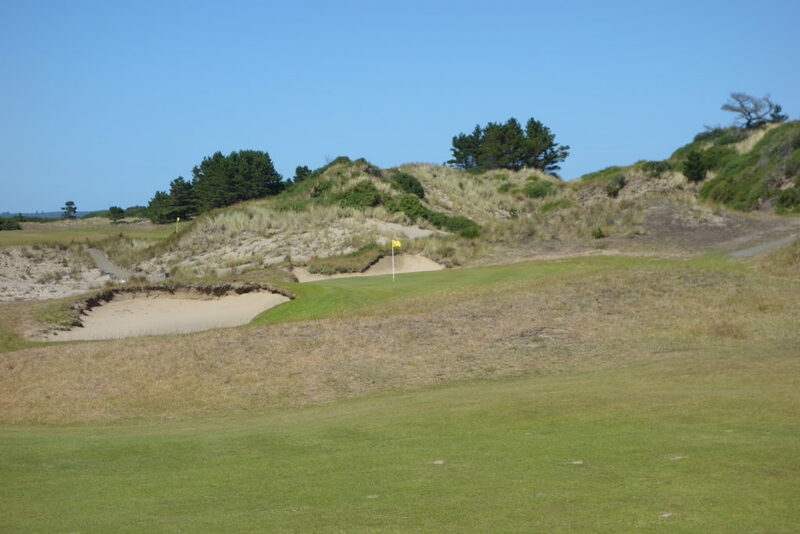 I had a 100 yard flip wedge into this green heading straight downwind… compare that to the last hole! 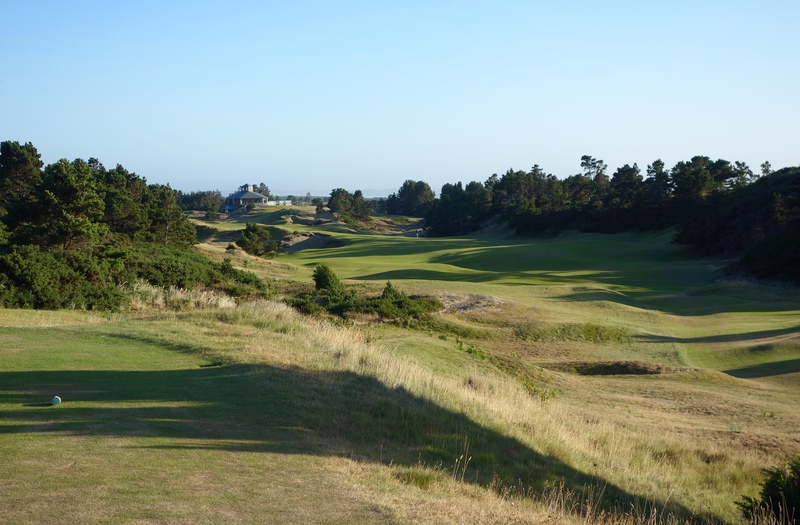 Hole #8 – 369 yards – An open fairway makes for an easy tee shot and a sloping green adds difficulty. Hole #9 – 369 yards – This hole has two greens and the lower left green was in play during our round. The line off this tee is the left walking path on the left, and big hitters can get right up to the green due to the sloping fairway. The right green is apparently very picturesque and plays to the right. 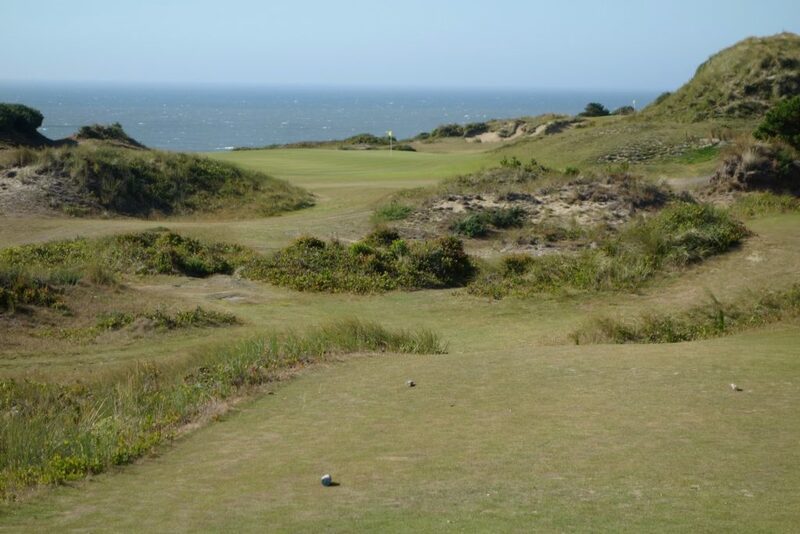 Hole #10 – 163 yards – The back nine begins with an epic par three looking back towards the ocean. The hole played about 210 into a strong wind during our round. Hole #11 – 131 yards – This is one of the favorite short par 3s. The hole appears short and easy, but into the gale alongside the cliffs, it played anything but. 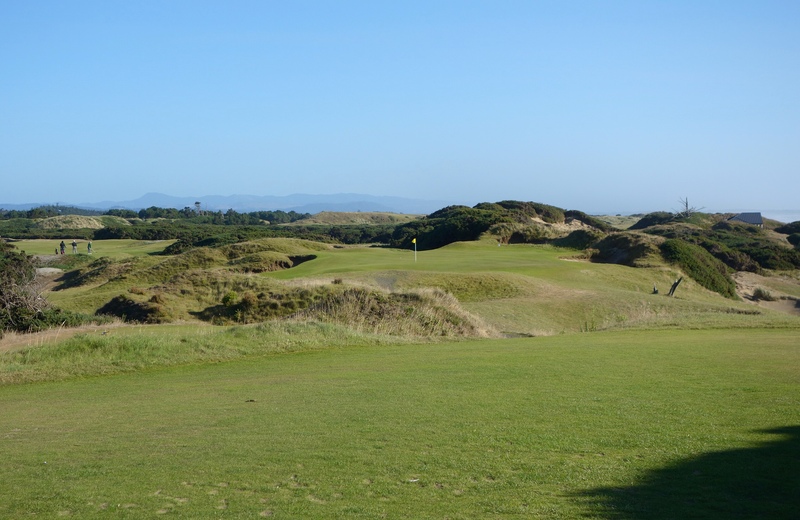 Hole #12 – 507 yards – A par five here reminiscent of the third hole. The green is tucked left behind a large bunker, meaning the best approach angle is from the right. 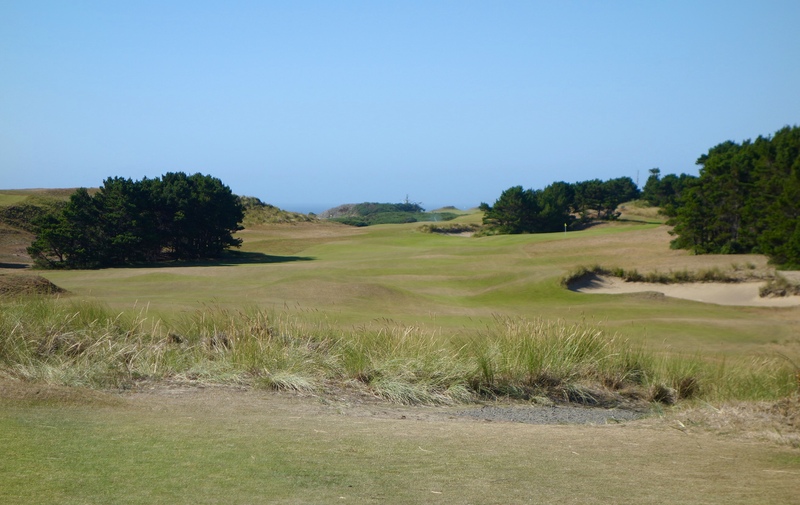 Hole #13 – 390 yards – This is a hole I was anticipating since seeing it on the third green and fourth tee. 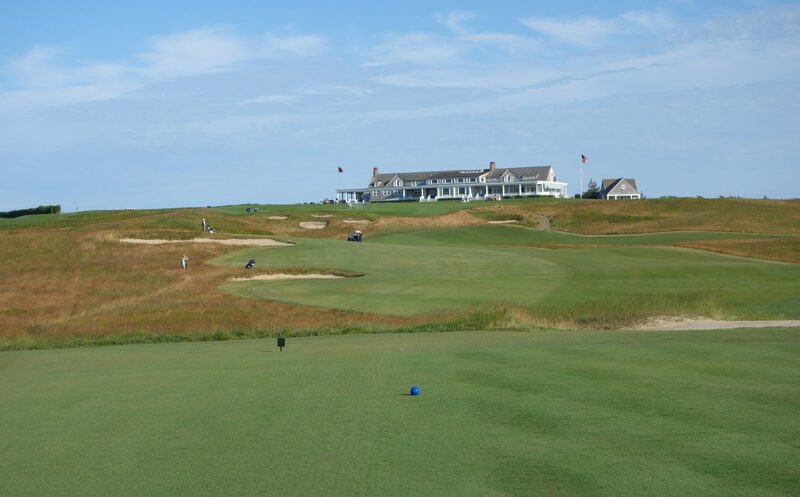 The hole begins wide and narrows at the green, which sits cliffside. 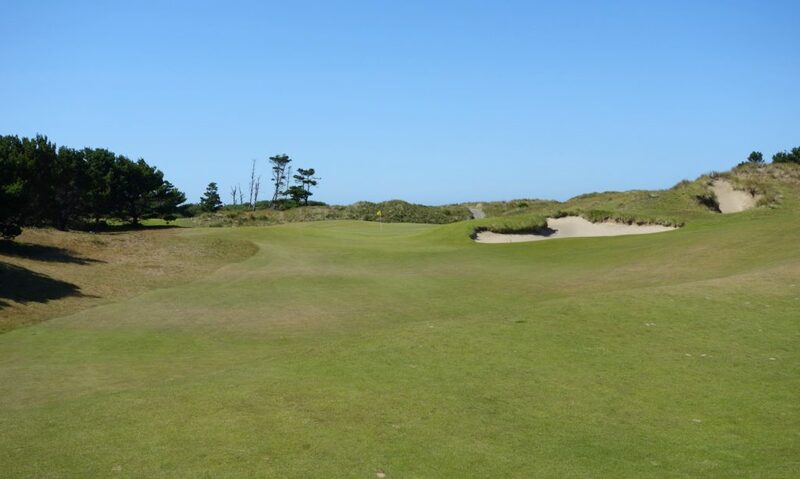 Hole #14 – 128 yards – The third par 3 on the back nine, this hole spills off on either side of the green into bunkers and collection areas. 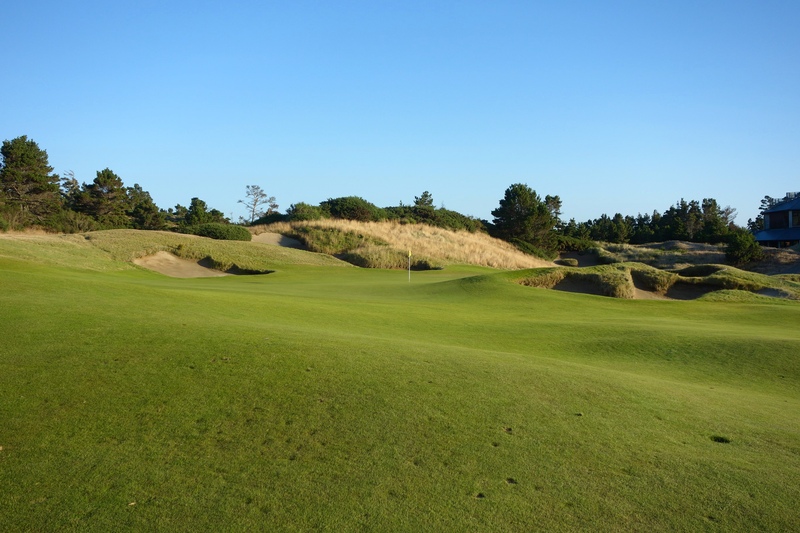 Hole #15 – 504 yards – Back downwind here, which brings the right fairway bunkers into play. The green has a large front slope that repels approach shots into a deep collection area short right. 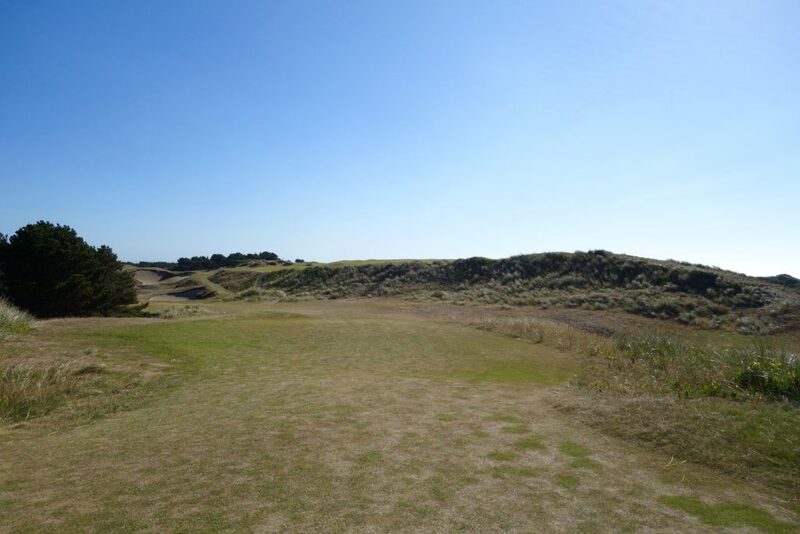 Hole #16 – 338 yards – You can’t see the green from the tee on this dogleg right. The best play is to hit an iron to the left side of the fairway, but big hitters can go for it, especially when playing downwind. 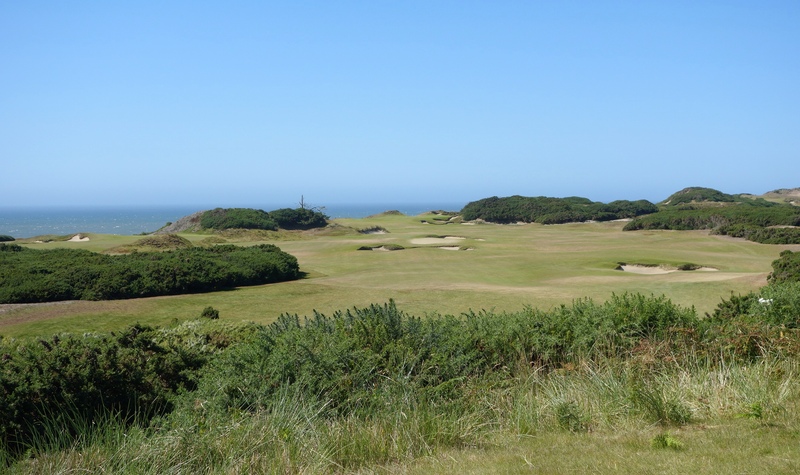 Hole #17 – 189 yards – Fourth par 3 on the back side! 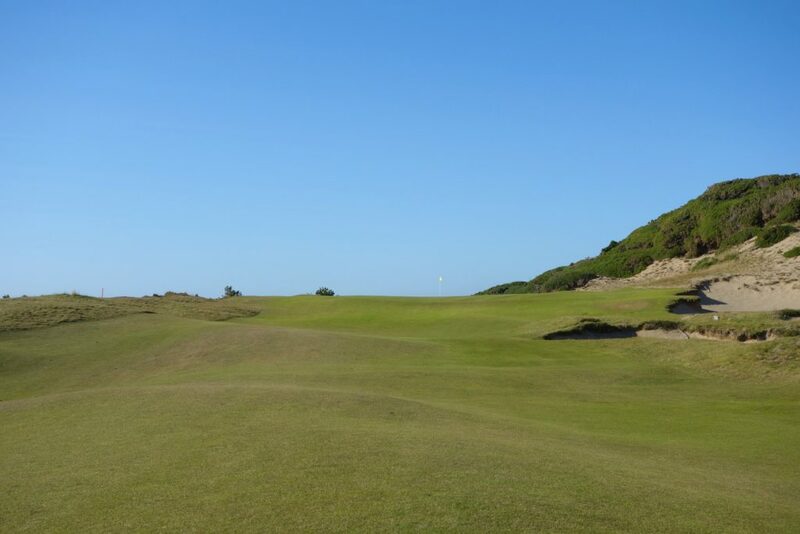 This green is massive, but you’ll be thankful for that as you send an approach shot sailing downhill towards the pin. 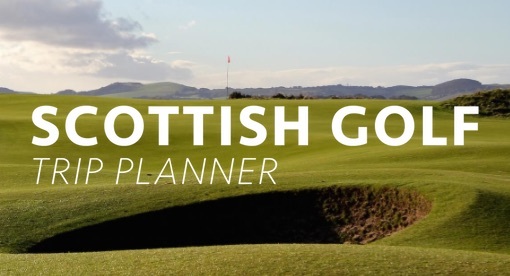 A slope short and right of the green kicks balls down towards the putting surface. Hole #18 – 575 yards – The final hole is the third par 5 on the back. If you’ve been counting, that makes for four par 3s, three par 5s, and two par 4s. It’s refreshing to play something totally different! Drives here leave a blind approach shot, but the green is reachable downwind with the sloping fairway. 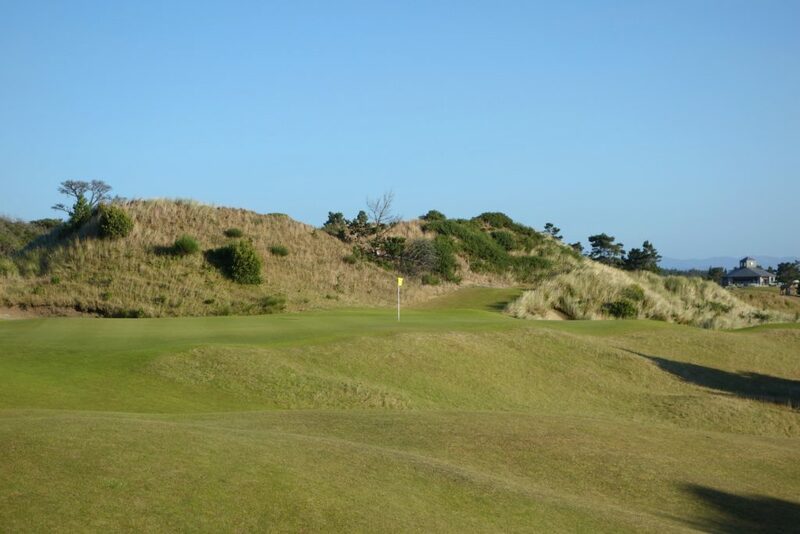 A front pin is attackable, but a back pin guarded by the front right bunker requires more creativity using the slopes… welcome to links golf! 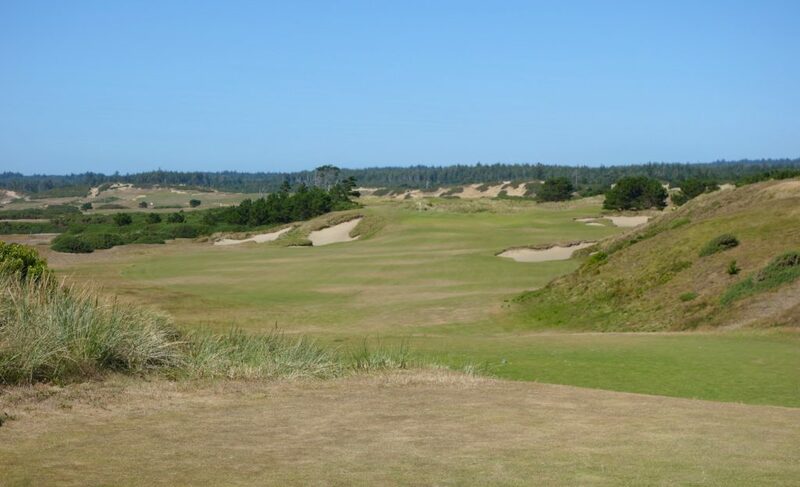 Pacific Dunes is my favorite modern links course anywhere in the world. I love that the back nine only has two par 4s. 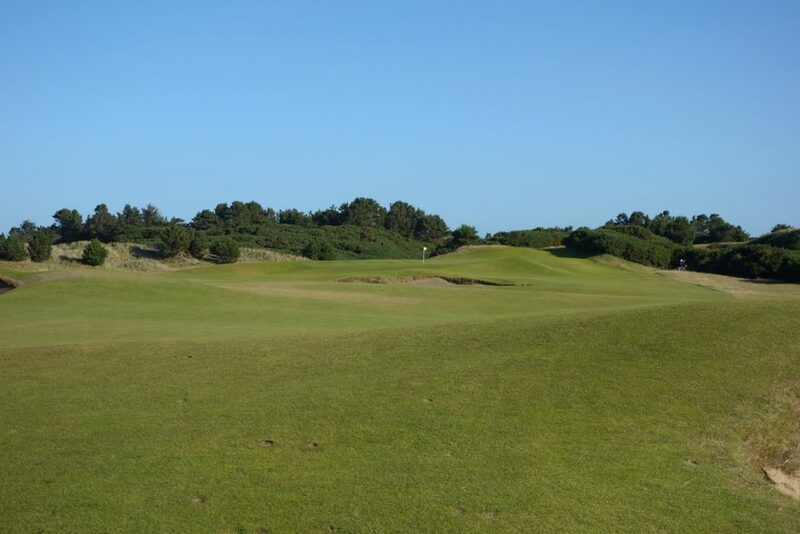 It is something totally different and it maximizes the tremendous land on which the course is built. Pacific Dunes typically ranks in the top 25 in the world in magazine top 100 lists and it unquestionably deserves to be there. 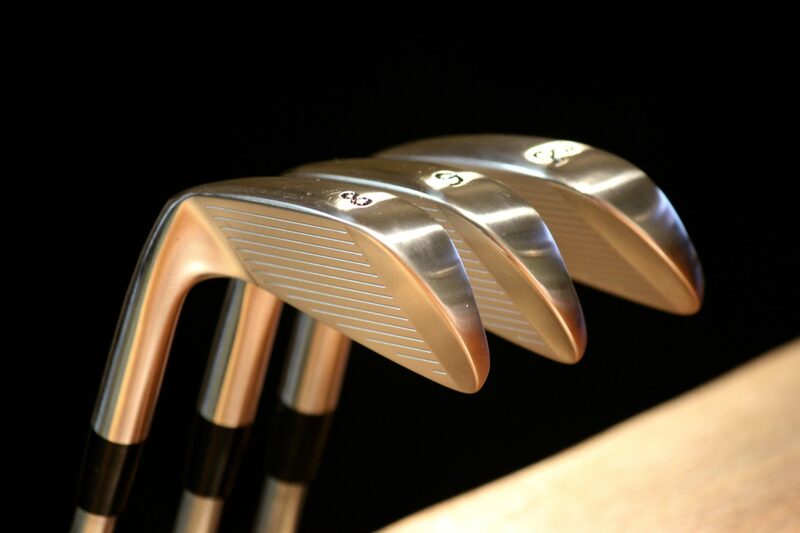 It has everything you need for greatness – setting, strength of design, consistency, and you’ll never play another course like it. One of my favorite courses, that I want to get back to play. Also a couple of my favorite paintings are of this course. 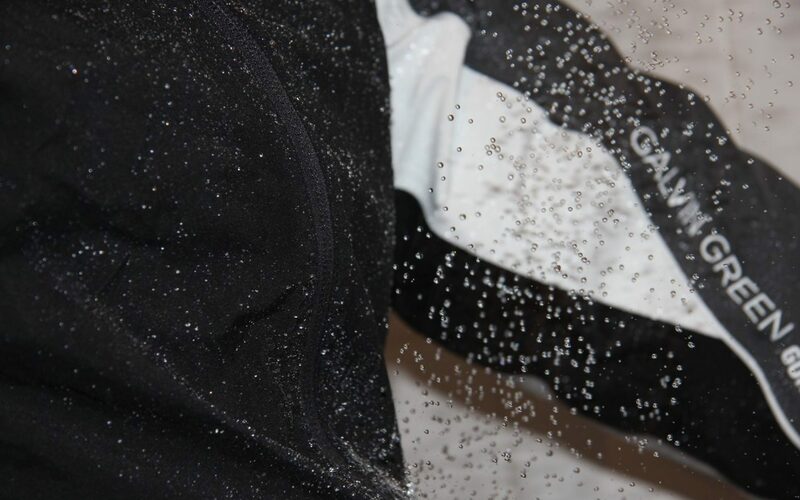 Not sure if you’re aware as it appears you were there in the summer months, but you should note in your review that the prevailing wind during the summer months blows from the north and then from the south during the winter months. 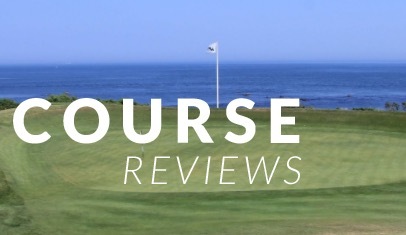 Would love to see a review of “Old Mac” as it’s the most links course of the four.